It's time for monkey business in this fifth outing for Teddington's wildest family, the Bolds! The Bolds are very surprised to be visited by Fred's mother, Granny Imamu. She's travelled all the way from Africa, and now she's here, she does not approve of what she finds. Hyenas, living as people - whatever next! Granny Imamu starts to stir up mischief with twins Bobby and Betty, encouraging them to get in touch with their beastly side at school. And then the twins' teacher comes to the Bolds with a rather unusual problem: her grown-up son Jeffrey just isn't like other people. He's rather hairy, doesn't much like to talk, and loves to monkey about. If animals can become people, could it happen the other way around . . . ? For children aged 8 and above. "I wanted to write a children's BOOK to relive the thrill I used to get as a child entering a fictional world. The idea came from stories I used to make up for myself as a child, and I grew up in Teddington " a very suburban place with tree-lined streets and a nice park " so it seemed right and proper to set it there. 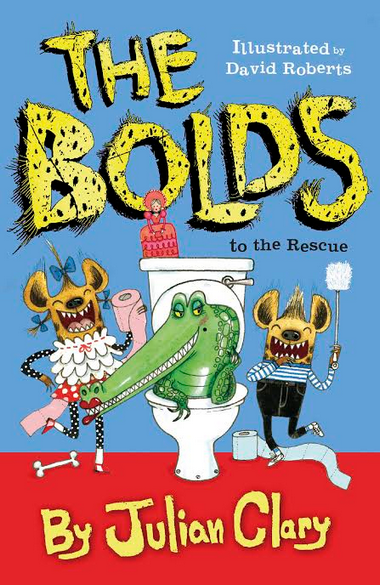 I am thrilled to have the wonderful illustrator David Roberts bring The Bolds to life for me. He has the ability to convey my humour brilliantly and his drawings are always funny and endearing. Mrs Bold's hats are a particular delight!" Julian Clary joined a stellar line-up of authors representing World Book Day 2018. Following the huge success of his children's series, The Bolds, Julian wrote a special story about his much-loved hyena family, which sees them move across the ocean from African safari park to England. The Bolds' Great Adventure is one of the 11 official World Book Day titles available from late February, when children in the UK and Ireland will be given a £1 token to claim their chosen book. World Book Day, which aims to encourage children and young people to read for pleasure, took place on 1 March 2018 with various events leading up to the big day.